What could be nicer than bathing amidst the mountains of Drôme and its gentle valleys? 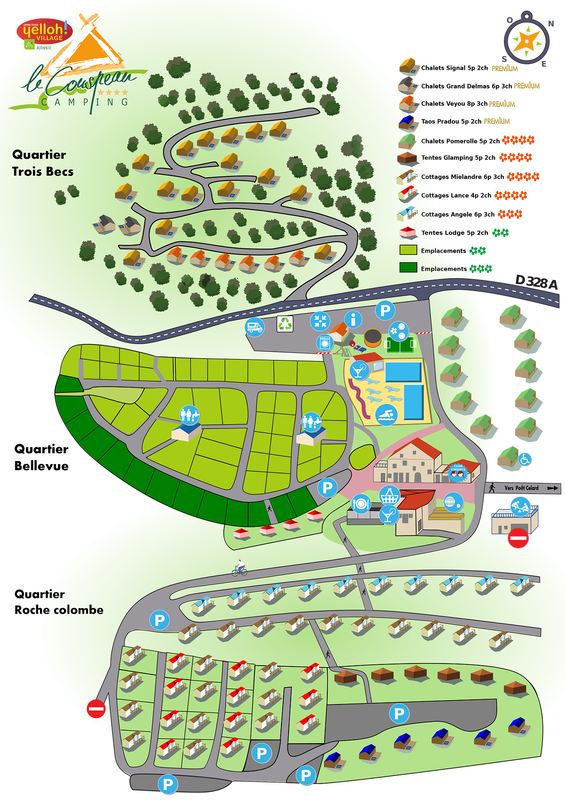 This is what awaits you at the aquatic park of the camping Le Couspeau. This aquatic park is designed so that the whole family will have a good time, with its heated and coverable indoor pool, an aqua-recreational area for the little ones, a waterslide, a whirlpool bath, an artificial river with a current and more! You'll also be able to enjoy the fresh air and sunshine of Drôme from a deckchair beside the aquatic park! Just a few kilometres from the Yelloh! Village Le Couspeau, you'll find many fantastic natural beaches alongside the river. So why not stop off for a spot of bathing in the heart of the countryside! Build a little dam with the kids, do a bit of swimming, relax...there are so many possibilities! And if you'd rather do some bathing in the lakes, then you'll find just what you want less than 40 km from the campsite at the Pas des Ondes lake. There's even a lake which provides some education, where you'll be able to see the local animals and plants, which children will just love!